Bondi Harvest Cafe is a casual dining destination inspired by Sydney’s most famous stretch of sand, Bondi Beach. Boasting a food philosophy focusing on locally-sourced produce seasonal cooking and healthy eating, amazing coffee, fresh juice and a laid-back friendly attitude. The space is full of sun and skate artifacts and elements. The natural worn wood, communal tables, and light blue accents scream comfortable surf shack. If you close your eyes, you might even hear ocean waves. The menu is as accessible as it is delicious. It is breakfast and lunch heaven (they close at 4PM on weekdays and 3PM on the weekends). Their unique flavors delight, with dishes like their fried egg sandwich with sriracha aioli and aged parmesan to their quinoa breakfast porridge with honey, greek yogurt and house-made granola. If you are wondering how a “flat white” is supposed to be made, Bondi Harvest has the Aussie coffee pedigree to do it right. At lunch, you can enjoy an Avo Toast (from the land that invented it) with smoked paprika and sea salt. Or partake in one of the most delicious, under the radar, burgers in Santa Monica: The “Harvest Burger.” This grass-fed beef masterpiece is topped with crispy bacon, aged parmesan and tomato, and slathered in their sriracha aioli. Minimum three napkins required to keep your blissfully smiling face and hands clean while you devour this sandwich. If you are looking for a great casual breakfast or lunch, or just want some amazing coffee and a slice of homemade banana bread, then Bondi Harvest Café is an excellent choice. We are honored to have them as a client. 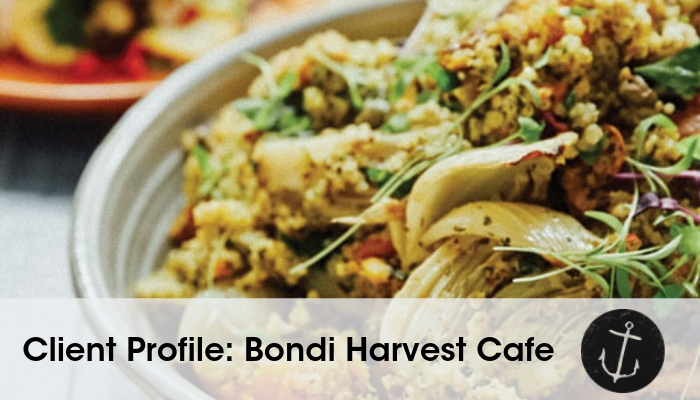 For more information, visit http://bondiharvest.cafe/. Bondi Harvest Café is located at 1814 Berkeley Street, Santa Monica, CA.